From crispy potato pancakes to bright pesto pasta, these 15 recipes prove potatoes are great in every meal. Upgrade potato hash with slightly sweet roasted sunchokes and well-aged cheddar cheese. What's the secret to this fast, healthy dish? Choose asparagus spears of similar size so that they will cook evenly. Serve these fantastic potato pancakes with smoked salmon and sour cream or scrambled eggs. This supersize hash brown has an especially crispy, golden-brown crust. 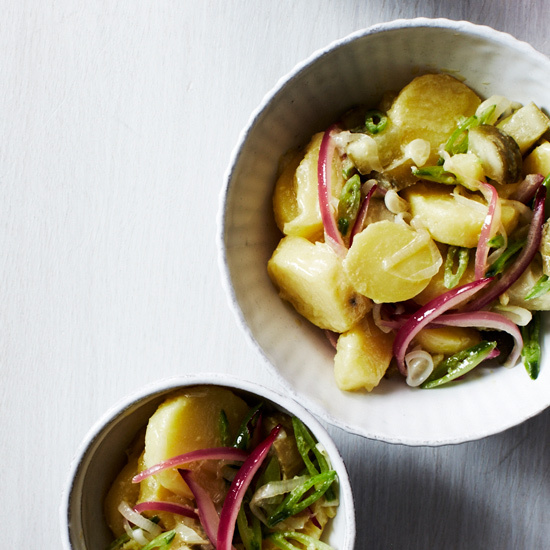 This spring version of a warm potato salad features lots of scallions and half-sour pickles. A whipped deviled egg dressing stars in chef José Andrés's terrific potato salad. Mashed potatoes form the crust for this delicious, savory pie. This silky soup makes great use of leek greens. Canned chipotles in adobo give these tacos fantastic heat. Wild stringing nettles give this soup its delicious tang. It can also be made with fresh spinach or a combination of parsley and sorrel. Mario Batali's incredible pasta pairs well with slightly nutty Soave. This delicious take on traditional potato gnocchi is fantastic with a super-fast brown butter and sage or Parmigiano-Reggiano cream sauce. This super-simple side dish is tossed with a black-olive puree. A splash of sherry vinegar gives this Portuguese potoato-and-kale soup its delicious tangy flavor. Star blogger Marte Marie Forsberg's take on traditional English pub meat pie features ale-braised pork and chorizo.